The Number Ones: The Beatles' “Love Me Do” . Beatles Radio: The Beatles, Solos, Covers, Birthdays, News The Fab 4 and More! 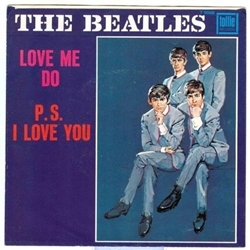 “Love Me Do” was eight years old by the time it hit #1. A 16-year-old Paul McCartney had written most of the song while skipping school in 1958, with his friend John Lennon helping out on a few parts. The two of them hadn’t even formed the Beatles yet. “Love Me Do” was also the Beatles’ first single; they released it in the UK toward the end of 1962. They recorded three different versions of it with three different drummers, though the one that featured the newly recruited Ringo Starr was the one that ended up coming out. The song only made it to #17 in the UK, but it established the group as something. It was only a beginning.